If you are visiting the Botanics in 2017 you might see some curious objects hanging in the elm trees. 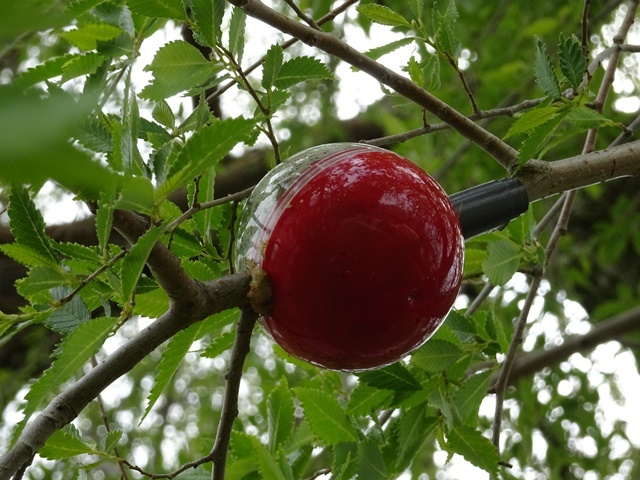 This is not an art installation, but in fact part of a programme to propagate some of the UK’s rarest trees. What you are seeing is plastic bottles filled with sphagnum moss and the technique being employed is called air layering, but more on that in a moment. 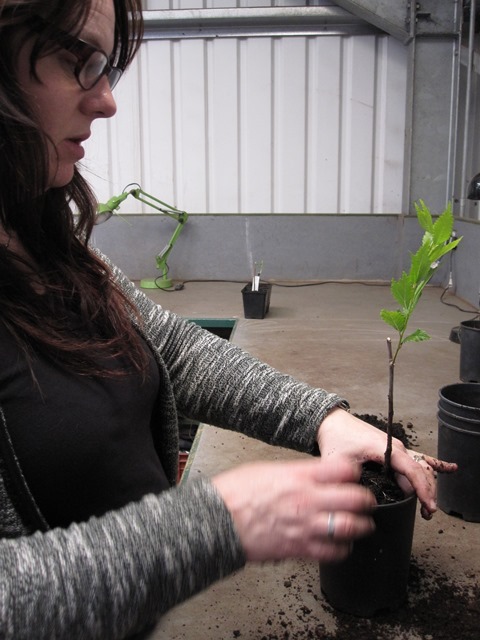 We first need to explore why the elms are worthy of such an elaborate propagation process. Air layering on the rare elm cultivar called ‘Pinnato-ramosa’ that grows outside the Temperate Palm House. Thanks to the efforts of tree enthusiasts across the UK there are numerous projects seeking to secure the future of elms against the threat of Dutch elm disease. Two hotspots of activity are Edinburgh and Brighton. What these areas have in common is that the Local Authority stepped in and took control of the disease problem by carrying out annual monitoring and sanitation felling of infected trees. This removes any dead and dying elms that are the breeding sites for elm bark beetles that spread the disease. In Edinburgh somewhere between 500 and 1000 elms are felled each year, but this is a price worth paying to keep the disease under control. Ulmus pumila ‘Pinnato-ramosa’ is a rare cultivated form of Siberian elm with an elegant weeping habit not typical of the species. The good news is that these efforts, carried out over many years, have preserved an unrivalled collection of mature elm trees in both Brighton and Edinburgh. Brighton is already recognised as a national collection and moves are underway to give formal recognition to Edinburgh’s elms. It is fair to say that visiting these two cities and seeing so many mature elms can be quite a revelation for anyone interested in trees. As both cities are places with large parks, gardens and cemeteries it is perhaps not surprising that their elm collections are remarkably diverse. As well as elm species from across the temperate world there are examples of many named cultivated elms. Gardeners and nursery owners have been selecting elms for centuries and during the 19th century elms were particularly fashionable trees. What has been preserved is a part of our horticultural heritage and it gives us a window on a period where elms were a ‘must have’ tree for owners of larger plots of land. Novel elms were in demand as it is human nature to want to have the latest new thing, and trees are certainly no exception. Some of these cultivars are simply distinctive individuals of a particular species, whilst in other cases they have arisen from hybridisation. Regardless of how they came into being, what all the cultivars of elm share is that they must be propagated by cuttings or grafting onto a rootstock. This is because producing seed involves a genetic lottery, not least because two parent trees contribute their genes. What this lottery means is that seedlings will generally not display the distinctive qualities of any given cultivar, and the only reliable way to ensure this happens is one of the many asexual propagation methods that create genetically identical clones. 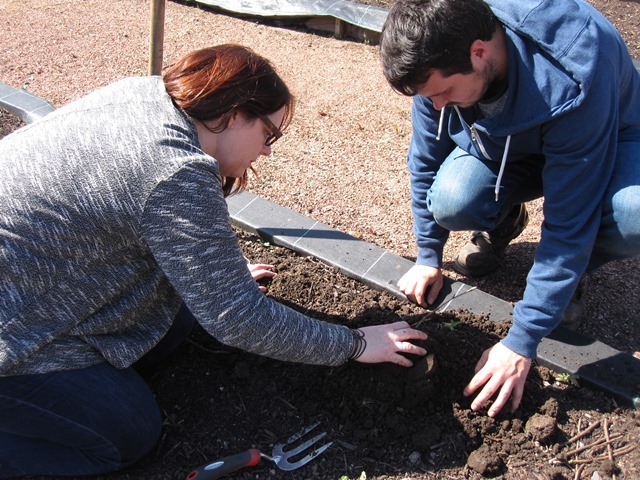 Duncan and Laura in the Nursery checking root development on outdoor hardwood cuttings. This is where horticultural expertise comes to the rescue. 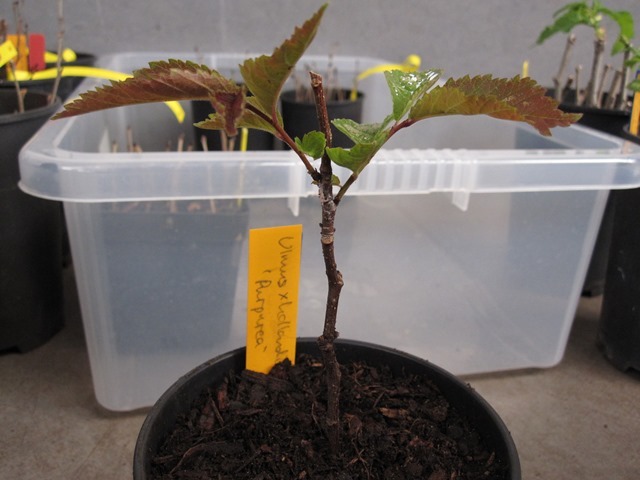 During the autumn of 2016 HND student Duncan Young began a programme of experimental elm propagation work with the aim of providing a more secure future for a number of rare elm cultivars in Edinburgh known to be on the brink of extinction. Some of these trees are down to the last one or two individuals and their loss in a storm or to disease would mean the end of the line for that particular elm cultivar. The most well publicised example of elms on the brink of extinction are the two remaining Wentworth elms at the Palace of Holyrood House. This cultivar, Ulmus x hollandica ‘Wentworthii Pendula’ is still only known to survive at the Palace despite considerable news coverage in October 2016. Laura potting a successful ‘Pinnato-ramosa’ cutting. 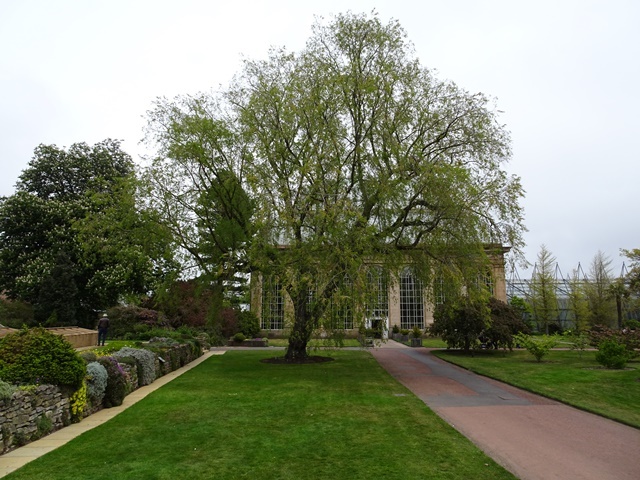 The elm propagation work at RBGE has focussed on five extremely rare elms, two of which are in the Garden’s own tree collection – Ulmus minor ‘Umbraculifera Gracilis’ and Ulmus pumila ‘Pinnato-ramosa’. Both of these cultivars could have some degree of disease resistance as they are of Asian origin and it has been discovered that Asian elms often display good resistance to Dutch elm disease. In addition to the Botanics trees, the Wentworth elm at the Palace and two very rare elms in Warriston Cemetery – Ulmus x hollandica ‘Purpurea’ and Ulmus glabra ‘Concavaefolia’ – have been included in the propagation programme. So far the focus has been on hardwood cuttings taken in winter. Some of these are already showing signs of rooting as healthy shoots are present on around 30 cuttings. As we are now into the growing season the possibility of softwood cuttings and air layering has arrived, bringing us back to the ‘strange fruit’ hanging in the elm trees that began this post. In this method a shoot is wounded with a knife and then bound with damp sphagnum moss inside a water retentive casing like a plastic bottle or, as pictured above, a specially designed container. The hope is that the wound will stimulate root production in the moisture held by the moss. As this can be a rather slow process having the shoot attached to the tree means that the water and nutrients is needs are still being supplied. At a point where root growth is sufficient the air layer is cut from the tree and potted. A rooted cutting of Ulmus x hollandica ‘Purpurea’, a rare purple-leaved elm known only from Warriston Cemetery.